Packing Light – We’re of the mindset that there’s only one way to pack, and that’s to pack light. Packing light saves time, money, and stress on bodies and on our planet. Think about the time spent waiting for baggage at the airport. Think about the money spent on having to pay for checked luggage. Then there’s the stress of worrying about lost or stolen luggage. Remember too, the stress on our bodies as we lift, lower, carry and cart around heavy suitcases. And there is the impact on the environment; less luggage means less fuel used to transport it. In our quest to bring you the best and highest quality information on packing light, we’ve compiled our Ultimate Guide to Packing Light. When you think of something you really need to bring, write it on this one list. Cross off everything you don’t absolutely need the first three days. Remember, you can buy just about everything abroad if you end up needing it. You know how work expands to fill the time? The same is true for bags. If you bring too big of a bag, you will fill the space. We done lots of reviews for the best backpack and our favorite lightest luggage. Though from pictures and reviews I’m partial to: Mother Lode Mini Duffel for business, the Osprey Farpoint 70 travel backpack for backpacking, and the Osprey Farpoint 40 for something a bit smaller. 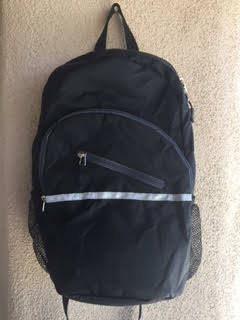 We love this small backpack from Sporting-USA. It’s not one you would pack exclusively for a trip, but it folds up nicely and at just 8 ounces, can be tucked into your luggage or travel backpack and used when needed for hikes, sightseeing, and around town. It’s waterproof, made of lightweight nylon and while it has separate sections, it has light straps and compartments. We have two of these backpacks, and they have become a family favorite. Quality — Luggage needs to be durable. Transportability — You will carry your luggage more than the carriers will. Airline carry-on limits — In the real world, there are two kinds of luggage: carry-on and lost. Fold your clothes in an efficient, wrinkle free manner. Use a special compression bag to roll and remove the air. 4-Hour Workweek: How to Travel the World in 10 pounds or Less Tim Ferriss’ blog post on “how to travel with 10 pounds or less” is a good post to see just how extremely light you can pack; however, his theory of “buy it there” isn’t always the best for the environment. Large, quick-dry microfiber towel – these can double as a blanket when needed. Tip: If you like the above ideas, the 4-Hour Workweek book is definitely worth the investment. Come As You Are: Wear your power suit on the plane and take it off once you get to the hotel. Group “Hot” Items: If you know that your money clip, tweezers, watch, or necklace is going to set off that metal detector, group those items into one carry-on that you can send through the x-ray machine. Leave the guidebook, novel and iPod at home. Every seven pieces packed should yield at least 14 ensembles. Each piece of clothing that goes into your luggage should be interchangeable with at least one other piece you intend to pack. Every shirt should match at least two pairs of pants, every blazer should work with at least two different shirts or sweaters, and so on. Wear your heavy clothes and travel shoes on the plane. There are many items you can find abroad that are cheaper than at home. Do not underestimate the value and benefits of flip flops. Save makeup and skincare samples that come with cosmetic purchases. Check online too! Brands like Neutrogena, Estee Lauder, and Nivea often offer a sample of some sort. My Money Blog: Save Time and Money by Traveling Light suggests packing the right travel clothes, including the right travel pants, like Sahara Convertible Pants. Only bring clothes from thrift store shopping. When you wear the same clothes repeatedly and wash them each night, they get worn out faster. So be sure to not bring your favorite clothes with you. While we disdain plastic bags, they can shield books from the rain, carry dirty laundry, keep small items in one place, and more. Stash a few in your luggage/backpack just in case. You can easily volunteer to be bumped on a full flight. You won’t need money to tip porters for helping you with your bags. When necessary, pack long underwear so you don’t have to bring extra pants and shirts. The world’s getting really small. You can buy Dial soap, Colgate toothpaste, Tampax, Nivea cream, and Bic razors in Sicily. Tourist shops in major international hotels are a sure bet whenever you have difficulty finding personal items. If you can’t find one of your essentials, ask yourself how 300 million Europeans can live without it. Rick Steves: Pack Light: You’ll never meet a traveler who, after five trips, brags: Every year I pack heavier. He also has packing lists. Bring a bar of soap and also use it for shampoo. Packing light for ski trips: fleece is the dominant fabric for layering. Packing Light with Double Duty Travel Gear suggests a filter water bottle which has a built in filter. One of the biggest things you can do to pack light is to pack clothing and gear that does double duty. If you need help booking your flights, check out our posts on Priceline Bidding. Wiki How: How to Travel With One Bag Also suggests packing using a bundle method. You can leave some items, like books and clothing, behind. By giving away and donating items not necessary for traveling, you help the area you visited. How do you pack light? What’s your best packing light tip? We look forward to hearing your tips! Here we have listed our top 11 tips for packing light for wherever you might be going. Try a few of these best practices for packing and lighten your load. Most of us start out wanting to be and striving to be light packers. We make lists, set goals, and prepare to want and need less stuff on our travels. But the reality is, it is really hard to do. In the past, I know if I had extra room in my luggage, I was thrilled. It became an opportunity to pack more stuff — after all, I had the room, so why not? You will endure less stress on your body the less you carry and tote around with you. And the less baggage you have and the lighter it is, the less fuel will be needed to get it from place to place. Also remember when you are on your journey that the more you bring with you means the more you have to manage and account for and repack and sort through. Lighter and less is best. The earlier you begin to pack, the more time you will have to take out what you don’t need. And let’s face it – it’s too easy to over pack the first time around. There are a lot of great travel bags, luggage and weekender totes available. Pick the best for your needs. Carry only the largest size you need. If you have one that is too big, either bring a smaller one or leave some of it empty. Resist the urge to fill it up just because you have the space. Here are the types of bags we own. We love the Under Armour Hustle II Backpack the best. It’s small but sturdy and even has a laundry pocket. We love the range of colors as well. I carry a fold up bag in my purse which works great for quick trips to the market. It is made from an easy-to-wash and dry fabric and hardly takes any space. It’s great for saving on using plastic bags too. Rolling clothes and bundle wrapping them (essentially wrapping everything around a central object) makes for fewer wrinkles and takes up less space – which allows you to pack a smaller and lighter piece of luggage. Guidebooks can be extremely heavy. By leaving them at home your bag will not only weigh less, but you’ll be more likely to get off the beaten path. If you insist on guidance for your journey, take a look at these 12 Paper-Free Guidebooks. There are great travel apps too. There are helpful hiking apps and even apps about eco-friendly travelling. You won’t even need to bring a big travel dictionary with these translation apps though a small one might still be practical. Coordinating your clothes around one central color scheme means you have to pack fewer shirts, pants, and shoes. Black or brown are smart choices. Depending on the climate, bring 3 long and/or 3 short sleeve shirts. When you bring 3 shirts you won’t be wearing what you wore yesterday. Honestly, three shirts is all you need. When I traveled around Europe for six weeks I wore the same 3 shirts, over and over and over. Yes, I was ready to never see those shirts again! I recently purchased 2 pairs of Ex-Officio Underwear. eek trip. Socks and underwear take up a lot of space and can weigh down your bag, so bring as few of these as possible. Layering is the key to packing light. Why bring a heavy coat when a fleece over a long-sleeve shirt over a t-shirt will do? Bonus tip: Make sure your shoes match your color choice. You can buy brand-name toiletries and cosmetics almost anywhere in the world. And with stricter environmental laws in the EU your toiletries available may be more environmentally-friendly. So if you don’t already own something, buy it when you arrive. The number one rule for packing light is to leave your variety-needing, self-conscious self (the one with a desire to look not only your best, but also different on a day-to-day basis) at home. When you travel you can literally wear the same thing everyday and most people won’t bat an eye. When you really think about the essential items you need, these tips for packing light will be easy to follow and to stick to when it comes time to pack. It may take some time packing and repacking to get it down to the essentials but it is possible. Packing is an art form, and the more kids you travel with, the more complicated it becomes. If you’re like most seasoned travelers, then you probably believe in a less-is-more philosophy. The trouble is that going anywhere with kids tends to mean packing more to keep everyone happy, or at least sane, while on the road. Soon, you find yourself in an unending and stressful quest to keep all of your luggage together. Does traveling with kids have to be this complicated? What to pack or not to pack… that is a big question. The secret is that what you don’t pack is just as important as what you do pack. When you figure out what you can leave behind, packing what remains is easier. You won’t have as many bags to keep track of, and chances are good that you’ll save money on extra and overweight bag fees. Don’t pack a thing until you’ve checked baggage limits and weight restrictions. A luggage scale helps to keep you on track. Be informed about what’s allowed as carry-on items if you’re flying. Liquids are still restricted by the TSA. However, baby essentials like formula and breast milk may be allowed in greater quantities. Get familiar with these amounts before your departure day, and plan accordingly. Few things are as disheartening as being forced to surrender a sizable portion of breast milk to the TSA. Whether you’re traveling by plane, train or automobile, it makes sense for every member of your party to have a day pack. This is a smaller, easily portable bag that’s filled with essential items that will be used while traveling. Most kids love this idea, and if they have a special backpack to fill, it’s even better. If your kids are young enough, you’ll want to supervise what goes into this bag. Items that are lightweight and not bulky are ideal. A small child’s day pack might include a favorite stuffed animal, a small picture book and a small toy. Crayons, coloring books and card games are also winners. A small water bottle with a tightly sealed lid and a snack like trail mix or dried fruit can provide comfort on the go. Your own day pack will look different, though it should still be light. Keep all essential documents like tickets and reservation confirmations in the day pack. You can also include your wallet, cell phone with charger, prescription glasses and sunglasses and prescription medicines. Kids love to explore the world, and that’s especially true in new places. Unfortunately, exploration sometimes comes with cuts and scrapes. Most of these aren’t serious, and they won’t put much of a damper on the fun if you’re prepared. Many stores sell travel first aid kits, but there’s no reason why you can’t put one together yourself. Essential items you might include in your first aid kit are assorted Band-Aids, antiseptic wipes, a bug bite and sting treatment and antibiotic ointment. Toss in some individual pain-reliever packets, some for children and adults, and you’ll be ready to deal with any minor emergencies. Pack it all in a flat plastic container or even a plastic bag with a good seal. It’s a small, light addition to your baggage that ensures your adventures go as smoothly as possible. How often have you spent frustrating moments searching for tiny baby socks or toddler underwear in a larger suitcase? These frantic searches for necessary items have a way of sucking the fun out of a vacation. Make it easier by using clear plastic bags or nylon mesh bags to corral small items. You might pack all of your baby’s socks in one bag and underwear in another. Alternatively, go with the “whole outfit” approach, packing all wearing apparel for a single day into a smaller bag. Top, shorts, socks, underwear and anything else that’s necessary gets popped into a bag before departure. Each day, you pull out a bag without having to search through every item in the suitcase to make an outfit. Playthings keep kids happy and occupied on the road, but not all toys are suitable for use in confined spaces like cars and airplanes, including toys that make noise. Also, if your little ones have a tendency to turn various toys into makeshift weapons, keep those at home too. This may make for fewer fights between siblings and having to make fewer apologies to startled adults. Whether they are cooped up in a car for hours or are forced to occupy an airline seat without moving, kids end up having an excess of energy to burn when they are on the go. The simple solution is to pack a jump rope for each child. You can pull off the highway at parks and rest areas or find a relatively underpopulated corner of the airport to let the kids jump for awhile. In a pinch, those jump ropes can also be used as clotheslines or fasteners. Traveling with infants is tricky and almost always involves a huge number of accessories. Instead of lugging a big stroller everywhere you go, look for the smallest, lightest umbrella stroller you can find. These can easily be checked at the gate at the airport or folded conveniently away in the car. If you need something bigger when you arrive at your destination, look for an opportunity to rent a more deluxe stroller. If you’re going to be gone for several days and are packing jars of baby food, resist the impulse to pack enough food for every day. It’s easy enough to scope out a grocery store on the road so you don’t have to pack quite so much. The same is true for diapers. Bring enough to get you through two or three days, and buy the rest on the road. Traveling with children can be a joy when you pack carefully. If you keep size and weight guidelines in mind, you’ll be less tempted to pack everything in sight. Moreover, if you resolve to leave bulky, noisy or easily purchased items behind, you’ll find that traveling light remains possible. Having young children doesn’t have to mean the end of your adventures when you follow these packing suggestions. wow, so many links! very informational. traveling light is very handy for moving around and I must say, your post is very true. holidays are best if you don’t have to worry about your stuff all the time. check out hotels in Fort Lauderdale for cheap rates that will maximize your trip further. This is a great collection of tips. I like the point about organizing the metal items together. Also, I think it’s important if you are taking a laptop, to take a very light one. Also, now that you can’t really take much in terms of liquids with you it makes it easier to not spill things. Pack a water filter straw. Takes up less room than a water bottle. Does the same trick and means you can drink tap water wherever you go – meaning no need to use the nasty plastic water bottles ! Great tips! I spent a year living in Paris and doing lots of traveling on super discount airlines like RyanAir and EasyJet, which all have obscenely strict rules on how much you can pack before the fees start piling on. Being on a tight budget was a great incentive to learn how to pack light! I even learned a new way to style my very curly hair when I made the decision to leave my blow dryer and straightener in Paris! I’m going ot forward this to my girlfriend because she doesn’t have a clue about travelling light, she can hopefully learn something….. I have never meet a traveler who, after five trips, brags, “Every year I pack heavier.” The measure of a good traveler is how light he travels. You can’t travel heavy, happy, and cheap. Pick two. ‘CNN.com: Packing Light, It’s all in your head recommends bringing a bar of soap and also using it for shampoo. ‘ – worst tip ever! If you’ve ever used soap to wash your hair you’ll agree. A MUCH better idea is to bring Shampoo and also use it as soap. This is one of the best packing guides I’ve ever read. I travel a lot and always try to pack light. Your guide will help me achieve more efficiency while enjoying more of the world. Thanks. whatever I do and however i tried to reduce my item..end of the my luggage is full..but the information are much helpful!! thanks!!! This is a fantastic article, I got a lot of value out of it and I hope others will as well. Great article. Thanks for the tips. I’ve been living out of my backpack for the last year. Its a great feeling to be able to go anywhere at any time. Those are great tips! With the cost of luggage transport seemingly always on the rise, finding new and inventive ways to pack more efficiently is probably one of the best cost savings possible while traveling. Thanks for the wonderful links and advice! Nice article. Thank your for sharing. Thank you so very much! 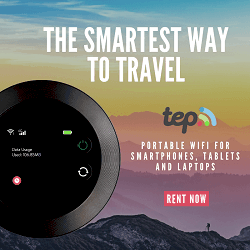 This has been the most helpful website I have come across in all my searches to prepare for my travel! Thank you! Love this article! This is the most informative article I have ever seen for information on how to pack light! We always talk about how easy it is to pack light, but until you actually do it and see that it is possible, it is often a difficult option to comprehend. Thanks for making this great resource page for others, hopefully we can all start traveling lighter. A tiny keychain flashlight is not just for the boonies. A big city can have a power failure too. 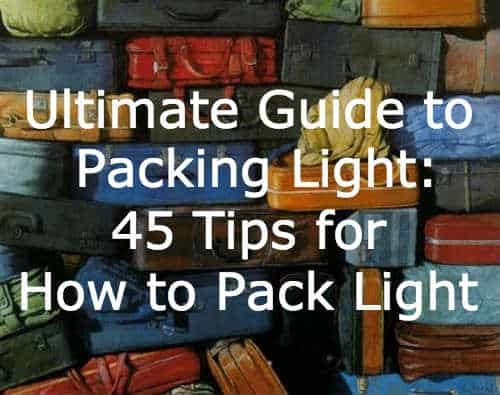 Great information on how to pack light. The part about packing light to help save on fuel costs is unique. It makes a lot of practical sense with the high cost of fuel. Thanks. That’s so useful. Having so much things to carry is disadvantage specially when you are riding in airplane so you must lessen your load. I am happy that you share us tips that will help us to lighten up our loads. It is quite useful for the sportsmen and tourists because of their trips to the other countries !! Fantastic article the solution of luggage problem…!!! 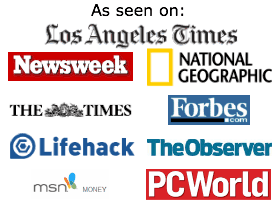 Wow what great directory of articles you created for packing lightly. Packing light will definitely solve so many issues if everyone did it. What I hate most is, and I’m guilty of this too – people going to visit friends or relatives they haven’t seen for a long while, always have to bring gifts and other random useless stuff. Why is this considered normal? You bring yourself as company to have real meaningful interactions! No? Well sometimes gifts are nice, but most of it is just ridiculous and it would be much simpler to just send some money over. Having a simple good quality carry on luggage with you wins every time. You bring what you need and not worry about your materialistic possessions getting lost. Pack light, use a hard case suitcase (my preference) and be particular about the amount of clothes for your trip. To save water and be better for the earth- choose to be earth friendly when you travel. Great advice ! I found rolling my clothes takes 20% lest space than just folding them normally. But more importantly, I think you need to be absolutely sure how much weight you can carry. Last time I travelled, I spent a whole afternoon trying to get it right, by taking things out, and putting lighter things in the luggage, ad nauseam… Only to find at the airport that I could have carried 2kg more because I had a computer! My favorite tip is traveling in a high quality, but second-hand capsule wardrobe – that way when return packing involves choosing between bringing home souvenirs or my clothing items, I don’t feel bad jettisoning anything I brought.